TRIPOLI, Libya — NATO's triumphant, 7-month air campaign against Libya ended Monday, setting the country on the path to a democratic transition less than two weeks after the capture and killing of ousted dictator Moammar Gadhafi. The alliance turned down a Libyan request to extend the protective umbrella for a few more weeks, apparently eager to exit on a high note and wrap up a costly mission at a time of financial austerity. The relatively quick victory in Libya represented a major boost for a Cold War alliance bogged down in a 10-year war in Afghanistan, a 12-year mission in Kosovo and the seemingly never-ending anti-piracy operation off the Somali coastline. The operation's critics – including Russia, China and the African Union – have argued that NATO misused the limited U.N. resolution imposing a no-fly zone and authorizing the protection of civilians as a pretext to promote regime change. But with alliance airstrikes helping open the way on the battlefield following a lengthy stalemate, revolutionary forces eventually captured Tripoli in late August and brought an end to the war with the death of Gadhafi on Oct. 20. "Together, we succeeded. Libya is finally free," NATO chief Anders Fogh Rasmussen told a joint news conference in Tripoli with Mustafa Abdul-Jalil, Libya's interim leader. Addressing the Libyans, he said: "You acted to change your history and your destiny. We acted to protect you." In the past seven months, NATO warplanes flew 26,000 sorties, including more than 9,600 strike missions, destroying more than 1,000 tanks, vehicles, and guns. U.S. planes flew a quarter of those missions, mostly in support roles such as air refueling and surveillance of the battlefields, while the European allies and four partner nations conducted the vast majority of ground attacks. As NATO pulled out, Libya's leadership, the 51-member National Transitional Council, was taking another step toward a democratic system, to be operational within two years. The council chose a new prime minister, U.S.-educated electrical engineer Abdurrahim el-Keib, who is to appoint a new government that will pave the way for general elections. El-Keib, an NTC member from Tripoli with a doctorate from North Carolina State University, said he would appoint the government within two weeks. The new government will oversee the drafting of a constitution. The NTC started out as an impromptu group of anti-Gadhafi activists, but evolved into a more carefully chosen interim government after the fall of the Gadhafi regime, said Jalal el-Gallal, an NTC spokesman. Fogh Rasmussen, the NATO chief, suggested the possibility of a future partnership with a democratic Libya, but made clear that NATO is ending its role. Asked about reports of unsecured weapons sites across Libya, Fogh Rasmussen said that "it is now primarily the responsibility of the new authorities in Libya to make sure that weapons are properly secured." Abdul-Jalil confirmed the presence of chemical weapons sites, and said foreign inspectors were arriving later this week to deal with the issue. Libyan leaders had requested an extension of NATO protection for a few more weeks, but Libyan officials said that was turned down. NATO leaders have repeatedly emphasized that although overall the campaign went very well, the conflict placed a significant burden on some alliance capabilities. "I think the critical resource that was stretched in the course of this was intelligence, surveillance, and reconnaissance," Adm. James Stavridis, NATO's top military commander, told The Associated Press in Brussels. Some senior officers in NATO suggested the alliance needed to extract itself quickly from at least one of those engagements at a time when defense budgets in Europe and the United States are being slashed as part of public spending cuts and other austerity measures designed to deal with the economic crisis. "Within the alliance ... we're concurrently doing Afghanistan, Libya for the past seven months, the Balkans, piracy (and) a counter terrorism operation in the Mediterranean," said Stavridis, who as the Supreme Allied Commander has ultimate responsibility for the wars and all other operations. He noted that Libya represented the first completion of a NATO operation. Asked whether NATO would possibly be providing training for the new Libyan army, Stavridis said that the focus of international assistance to Libya should be on a bilateral basis with Arab and Western nations. "At the moment there's no discussion with in NATO about a follow-on role," he said. "We're not planning on anything nor have we been tasked with anything at this point." The ouster of Gadhafi would not have been possible without NATO. In the early days of the armed rebellion, anti-Gadhafi fighters rapidly seized territory, particularly in Libya's east, but quickly lost ground again, and by late March, Gadhafi's troops were advancing toward the rebellion's stronghold, the eastern city of Benghazi. NATO interceded, armed with a U.N. Security Council mandate to protect Libyan civilians, and flew its first bombing sorties at the end of March. However, the alliance often appeared to be doing much more than shielding civilians. It worked closely with revolutionary forces, its airstrikes of regime targets paving the way for rebel advances in those areas. It also widened the range of targets, going not just after tanks and rocket launchers, but also symbols of the Gadhafi regime, including his sprawling residential and government complex, Bab al-Aziziyah, in downtown Tripoli. At one point, NATO bombed Libyan naval vessels after the Libyan navy tried to mine the harbor of the besieged rebel-held port of Misrata and tried to carry out attacks on shipping there. With the end of NATO's Libya mission, the alliance has faced some calls to intervene in Syria's uprising. But Fogh Rasmussen said NATO has no intention to get involved in Syria. "I can completely rule that out," he said. "Having said that, I strongly condemn the crackdowns on the civilian population in Syria. What has happened in Libya sends a clear signal to autocratic regimes all over the world – you cannot neglect the will of the people." Associated Press writer Rami al-Shaheibi in Tripoli contributed report. 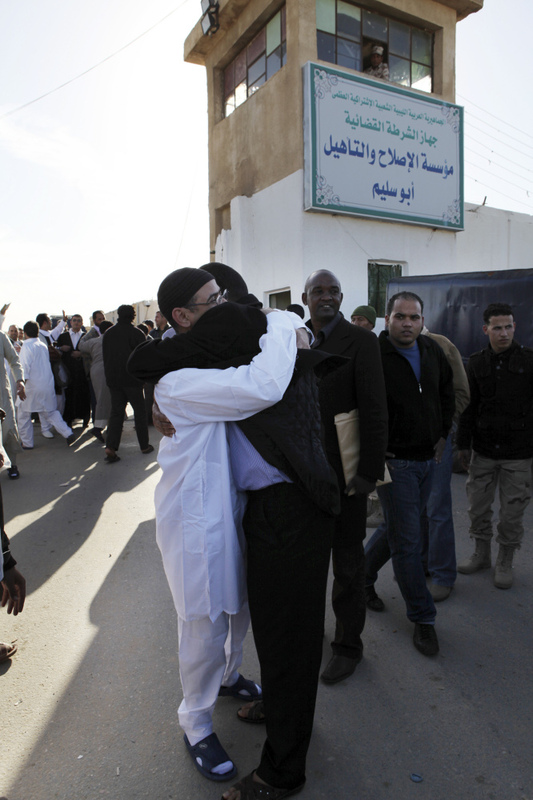 A Libyan prisoner, left, is hugged by his relatives after he was released with a group of 110 prisoners from Abu Salim, Libya's most notorious prison, in Tripoli, Libya, Wednesday, Feb. 16, 2011. Inspired by the unrest in Egypt, residents of Libya's second largest city Benghazi started protesting against the regime of long-time leader Muammar Gaddafi in February 2011. In an attempt to calm the protests, Gaddafi's government released 110 prisoners and offered to double government employees' wages. Yet protests spread to other cities and intense fighting erupted between Gaddafi loyalists and rebel fighters.